FK Lowry Piling have successfully completed a £600,000 Piling contract for the New Weir Road Bridge in the North East for Farrans Construction. The new road bridge will be a three span cable-stayed bridge with an A-frame pylon rising to 105m (344ft) crossing the River Wear between Castletown on the North, to Pallion on the South bank. The new bridge will have two lanes of traffic in each direction, plus dedicated cycle ways and footpaths along its full length. It is scheduled to open in spring 2018. Twice the height of Nelson’s Column, and bigger than Big Ben, Sunderland’s new bridge will be hard to miss. FK Lowry Piling installed 800 No. 350mm Sq.& 270mm Sq. Driven Precast Piles using its modern Juntann PMX20 Driven Piling Rigs. 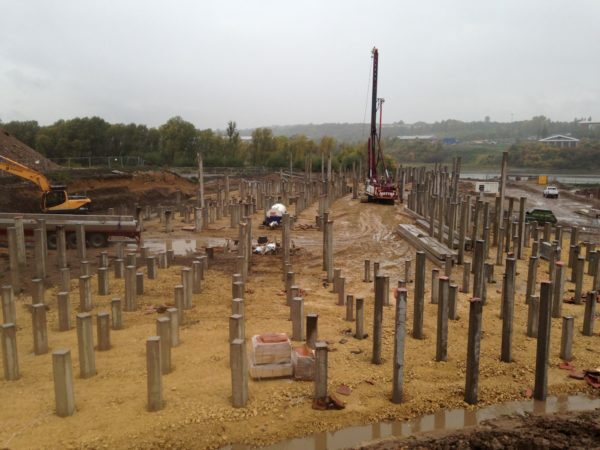 Driven Precast Piles were driven to depths of 12-16m through underlying soils of Made Ground, firm Clays and dense Sands for working loads of up to 1200kN . The Pile Design was verified by the installation and testing of 4 No. Static Load Tests. FK Lowry Piling continues to build on our Driven Precast portfolio in the North East Market following recent projects at the Port of Tyne and Bedale By-Pass Projects.